The Australian Government is reviewing two consumer credit markets that heavily impact on the lives of many low-income Australians – payday loans and consumer leases for household appliances and furniture. Among other matters, the review, triggered by a requirement in the Credit Act is investigating whether the current regulatory regime strikes a “fair balance” between the need for these industries to remain viable and the need to protect consumers from exacerbating their risks of financial hardship. It is a significant – and welcome – step in the right direction that the review’s Terms of Reference recognise the link between the payday loans (also known as Small Amount Credit Contracts) and household goods rental markets. However, more is required to adequately understand how low-income Australians actually manage their money, the scope and scale of their credit market engagements, and why this is crucially important for regulators to consider. 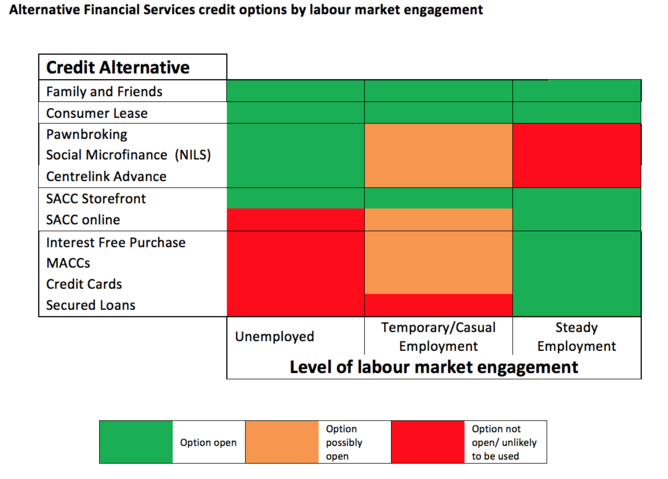 In our paper published this week analysing trends in Australian small loans markets, we argue that two basic frameworks underpin the relationship between the credit practices of low-income households and the firms that provide various forms of consumer credit. The first framework has been termed by University of Queensland researchers Greg Marston and Lynda Shevellar as the mixed economy of credit – the complex routines and resources used by many low-income citizens in exercising their constrained credit choices. They describe how there are very different costs and calculations involved in making decisions about borrowing money from the private sector, the state, family members and friends, or through non-government microfinance schemes. There are pragmatic considerations such as the location of different credit providers, cost, eligibility, speed and knowledge of available options. Emotional costs also need to be weighed, such as the potential risk of shame or stigma seeking credit from a parent or a welfare agency. The mixed economy of credit also has a very strong temporal dimension, as low-income consumers tend to assess the affordability of credit by periods that conform to their fortnightly receipt of Centrelink payments. Secondly, various credit products and services have been developed – particularly in the last three decades – as market responses to the economic, geographical and emotional calculus involved in the mixed economy credit that is occurring within each citizen’s debtscape. An Alternative Financial Services (AFS) market has emerged – an economic framework comprising firms offering multiple lines of services and products to meet the needs of low-income and precariously employed households. These firms provide payday loans, pawnshop services, rent-to-own household products and other forms of consumer leases, credit “repair” services, layby arrangements, debt collection services, in-house used car loans, “check-cashing” services (especially in the United States) and low-income insurance products. Each AFS sub-market is highly complex. Firms in the small loans industry, for example, have specialised, multiline business models designed to offer particular products, such as pawnbroking and payday services, brokering services, or a suite of vertically integrated loan options that extend from low-margin, high volume and higher-risk small loans to higher-margin, lower-risk unsecured and secured credit valued in the thousands of dollars. Each model takes a different approach to minimising default risk, encouraging repeat custom, sourcing new customer groups, leveraging value from consumer interactions, and instituting administrative and compliance efficiencies. Approximately 90% of online applications are rejected by SACC providers who nevertheless monetise these applications by on-selling the data as “lead-generators” to other lenders willing to take on higher-risk customers and to other markets such as consumer product retailers. One leading online industry stakeholder estimates that the lead-generation market is now larger in Australia than the small loan market. An understanding of the AFS industry is very poor. We don’t know how many Australians use these services, nor in the ways these financial products are being incorporated into a low-income household’s mixed economy of credit. Only partial insights are available due to the lack of industry-wide data on consumption patterns (or anything else). We know that the costs of consumer leases are highly polarised. On a total cost basis, consumer leases are the most expensive way to access a household appliance. However, on a fortnightly basis, they are one of the cheapest. We know that over a million Australians are estimated to take out, on average, three payday loans each year. On the other hand we know that about 25,000 Australians took out a No Interest Loan Scheme (NILS) loan from a not-profit agency last year. The table below shows some stylised facts of what we have gathered so far about the relationships between the AFS market and consumers who are unemployed, casually/precariously employed, and those with regular paid income. What are the implications of these insights for the current review? Should there be a national database where all credit providers are required to upload transactions in real time? Should the industry be more tightly regulated? While these are important questions we believe they do not address the fundamental problem: we do not clearly know why consumers access these forms of credit nor the scope, scale or patterns of their usage. We do not know what specific (and overall) interactions with the AFS market may be contributing to low-income Australians becoming increasingly indebted. While basic insights have been established, such as taking out multiple payday loans at the same time increases financial hardship, we do not know the welfare effects of more complex borrowing practices across the broader AFS marketplace. Further, we don’t know how environmental factors have contributed to the growth of the industry. For example to what extent has government policy, changing labour market conditions, rising levels of income inequality and poverty, and the changes in the banking sector led to the growth rates we have observed? We strongly believe that unless these questions are explored any market interventions run the risk of being inefficient and unhelpful. Any new regulatory regime developed from a review only examining one foot of the elephant (in this case certain aspects of the Australian AFS market) risks exposing low-income households to possibly greater financial hardship and emotional distress – especially when viable credit and welfare alternatives are not being seriously considered by the government.